At Stock Informer we provide up to the minute stock alerts for the Kinect. We track both online Kinect stock and High Street Shops and also provide a free email and text messaging service. Friday 26 Apr - Latest - Amazon currently have stock of Xbox Kinect for with free Delivery. Kinect for the Xbox 360, is the revolutionary way to play video games. You become the controller. No need to hold a hand held device pushing buttons or waving it around in the air, Kinect's sensors will track your body movement precisely. From head to toe, use your arms, legs, head and torso to control your on screen character. Using facial and voice recognition, Kinect will also recognise you when you stand in front of the camera and automatically log you into Xbox Live (subscription required), where you can play interactive games with friends or chat via webcam links. Kinect sensor can even detect different emotions in your voice allowing for more varied gameplay depending on your stress levels! Compatible with all previous and current versions of the Xbox 360 Console, Kinect (formerly known as "Project Natal") plugs directly into your Xbox 360 console and sits directly in front of your TV. The UK recommended retails price is £129.99, however retailers are free to charge what they like, which during periods of stock shortages means that prices may rise at certain stores making it more expensive to buy Kinect sensor. At Stock Informer, we will monitor all Kinect stock and prices and keep you immediately notified when Kinect stock is found at both online retailers and shops near you via email, text messaging or our website. Our servers are constantly tracking for Kinect stock, so you don't have to. When you buy the Microsoft Kinect sensor, you will also receive a copy of the Kinect Adventures game to get the fun started straight away with your new Kinect. Over 20 new challanges await you from scaling mountains to steering your raft through raging rapids. 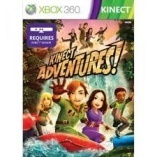 Play on your own or with friends and family, either way Kinect Adventures is terrific fun and social. Take action shot photos or video on the fly and post to your Facebook and Twitter pages or email them to friends and family.